Don’t wait until tea time to have shortbread – morning coffee is just as good. There is only one way to make shortbread and that’s with butter. I think it’s a waste of electricity to use anything else. Cream butter and caster sugar together until pale and creamy. Add both flours and mix well until you have a smooth dough. Divide into two and press into 8” round sandwich tins. Crimp the edges with a fork handle and prick all over. Bake for 1 hour 100ºC. Take out of the oven and allow to cool slightly, cut into 8 triangles with a sharp knife (that’s the hard bit, getting it even). Dust with caster sugar while still warm, then the sugar will stick and not fall off when you lift the shortbread. 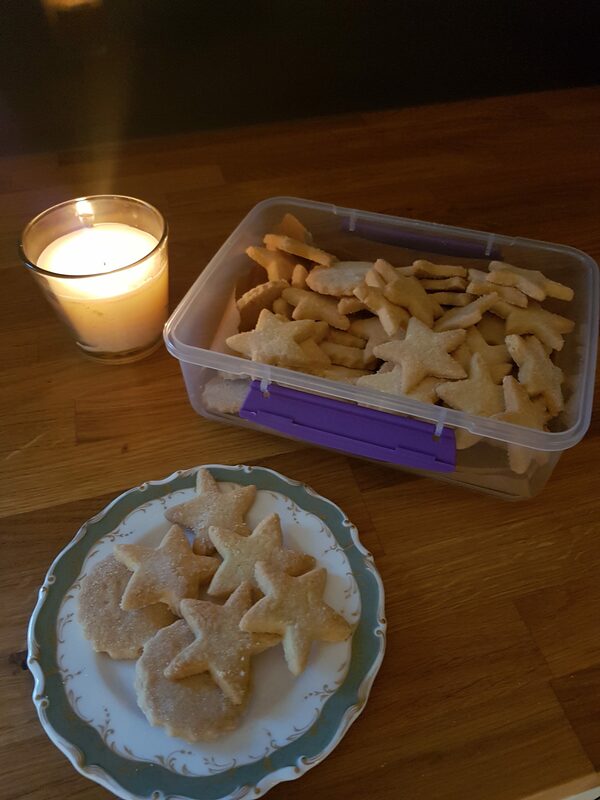 You can roll the shortbread out and cut into shapes and bake for about ½ the time (when slightly coloured they will continue to cook while they cool) I make star shapes at Christmas, but rounds are great to serve with fresh fruit or creamy desserts yummy! Ginger Shortbread is very nice to serve with lemon desserts add about 2 level tsp with the flour. You can also make this shortbread in a food processor just add all together and wizzzzzzzz until it forms a dough. Lucky enough to arrive when shortbread coming out of oven……. Absolutely melt in your mouth delicious!